Mahmud of Ghazni, founder of the Ghaznavid Empire, was the son of Sebuk-Tigin, a Turkic slave soldier who rose through military service to lead a small client state of the Abbasid dynasty in Afghanistan. Mahmud assumed control of this state in 997 after defeating a challenge from his brother Ismail. 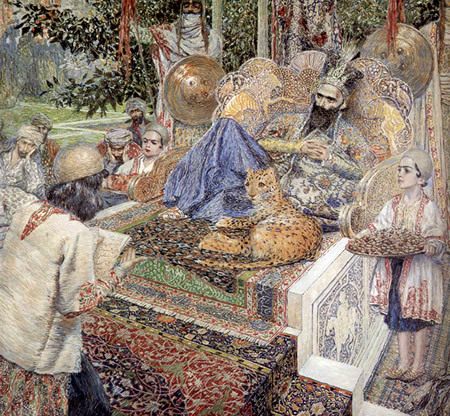 Although the state he inherited was small, Mahmud moved aggressively to expand his landholdings, launching military expeditions into eastern Iran. Ghaznavid forces conquered Khurasan in 999, which led to the collapse of the Samanid dynasty, and in 1009, the Iranian province of Sijistan also fell. The Ghaznavids defeated their only rivals to power in the eastern Islamic lands, the Khwarazmians, in 1017. Mahmud pushed as far west as the Iranian province of Rayy—ruled by the Buyid confederation based in Baghdad—and conquered it in 1029. Despite his substantial conquests in eastern and central Iran, Mahmud’s greatest legacy was the expansion of Muslim power eastward into South Asia. Beginning in 1001 Ghaznavid armies campaigned in India, occasionally returning to Iran to beat back incursions by nomadic Turkic tribes from Central Asia. Mahmud went as far south in India as the state of Gujarat, though he was only able to establish firm control over the northern region of Punjab. Although he used Hindu Indian auxiliary troops, Mahmud also ordered or allowed the destruction of Hindu temples. However as a fundamentalist Sunni Muslim, he also ordered the persecution of Shi’i Muslims, both in the Indus Valley and in Rayy, which had been ruled by the Shi’i Buyids. Mahmud’s military successes were balanced out by his patronage of certain Muslim scholars and philosophers, including the famous historian and anthropologist Abu Raihan al-Biruni, who wrote a lengthy and detailed study of the Indian subcontinent. At its height, during the reign of Mahmud, the Ghaznavid Empire stretched from the Caspian Sea in the west to the Punjab and northern India. After Mahmud’s death in 1030, his son Masud assumed the throne. However the empire’s centralized structure began to disintegrate, as Masud concentrated on further expanding Ghaznavid authority in India while failing to recognize the threat posed by the Seljuk dynasty, which began to move into Ghaznavid lands in Iran. Masud tried to stop the Seljuk advance but was defeated in 1040 at the Battle of Dandanqan and was overthrown the next year. The Ghaznavids remained in power until 1187, though their landholdings were steadily reduced until they included only the city of Ghazna in Afghanistan and small sections of that region.